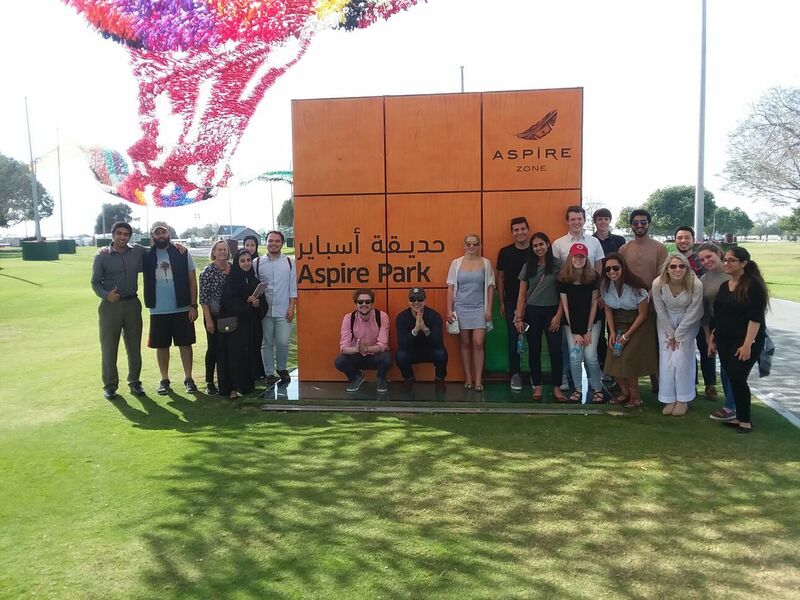 Students in the class “Politics and Sports” from the main campus and SFS-Q tour the Aspire Academy sports facilities in Doha. Through the Spring 2018 course “Politics and Sports,” Professor Betsi Stephen paved the way for educational innovation at Georgetown. The online class brought together students from the main campus and SFS-Qatar to explore complex questions at the intersection of sports and politics. Stephen was granted a Senior Fellowship from Georgetown’s Center for New Design in Learning and Scholarship (CNDLS), positioning her to be an on-campus leader for online classes. “I believe I’m still the only professor who has taught an undergraduate online class during the academic year,” Stephen says. Last spring, Professor Stephen taught an online SFS-Q course called “Borders and Security Concerns.” While she was visiting Doha that March to meet with her students, she met with the deans and the staff of SFS-Q to discuss plans for the upcoming SFS Centennial, including the development of SFS Centennial Labs. Stephen jumped at the opportunity to teach one of these classes. Stephen and the main campus students in Qatar. She delved further into the topic over the summer, reading Professor Victor Cha’s book Beyond the Final Score, which studies the 2008 Olympics in Beijing, China. This book ended up tying into the class nicely, specifically with their discussion on the Winter Olympics. Cha also guest lectured a class on the subject. “The timing of the class was just perfect with everything going on in the sports world, from ‘take-a-knee,’ to the Olympics, to the NCAA scandals,” Stephen says. The class focused specifically on two case studies: the Winter Olympics in South Korea and the 2022 World Cup in Qatar. But they also explored broader themes surrounding the political aspect of sports. The class was composed of three undergraduate sections: 10 students in Qatar, 10 students from the main campus who went to Qatar for spring break, and an additional 15 main campus students who did not travel. Stephen also taught the class concurrently to MSFS students. The class visits the Supreme Committee for Delivery and Legacy of Qatar to meet with representatives from the Josoor Institute. Every week, Stephen would email the students that week’s assignments. The online format of the class afforded students the flexibility to complete their coursework when was best for them. “The most obvious benefit of an online course is that you can study for it whenever you want and you don’t have the pressure of meeting weekly,” says Walli Ullah (SFS’18), a student from the Doha campus. “The discussion forum is a lively space, and the course has been an innovative learning experience, as students engage in weekly discussions and group project collaboration,” adds Sanjay Iyer (MSFS’19), Stephen’s teaching assistant. But the online format, and the lack of face-to-face communication, also presented some challenges. Overall, students found the experience of connecting with their peers from the other side of the world to be incredibly valuable. “While working in a team that has members living eight hours apart can be challenging, I think the U.S.-Qatar campus collaboration allows each of us to bring our own experiences and ideas to the table thereby making our final product the best that it can be,” says Afif Haitsam (SFS’18). The class brought together perspectives from Qatar, the U.S., and beyond, allowing for a more enriching experience for all students involved. “The conversation and learning exchange—from discussions of how the 2022 World Cup was transforming Qatar to discussions about the intersections of race, gender, and sports in America—was riveting, and was ultimately aided through the engagement of both campuses,” Iyer says. This international learning experience was also a beneficial learning exercise for the future. “Like any good SFS student, I hope that my future job entails cross-continent collaboration, so being able to work with our Qatari counterparts has been an enlightening experience,” says Ian Scholer (SFS’19). Over spring break, the class traveled to Qatar where they participated in a wide range of activities. They went on field trips to a stadium, the Aspire Academy (which trains and educates young soccer players), and the Josoor Institute, which is organizing the 2022 World Cup in Qatar. The groups presented their semester-long projects, and the main campus students went on tours of Doha. They also met with the Dean of GU-Q for lunch and had dinner with a group of alumni. Parker Houston (SFS’19) looks up at the skyline of Doha, Qatar. The trip to Qatar was a particularly enlightening experience for the main campus students. “In Qatar, it was also wonderful taking the time to sit down with our peers and get to know more about the country, its inter-politics, and the influence Georgetown has as one of the six American universities in Education City,” says Zeke Gutierrez (SFS’19). The experience also allowed students to see what they had learned in the class applied to real life. Stephen expresses hope for the future of innovative classes like this one, noting the work of Associate Provost Randy Bass and the Red House in leading on the issue. CNDLS is also hosting the Teaching, Learning, Innovations Summer Institute this summer, which will expose faculty to a variety of new innovative teaching opportunities. One of the main takeaways for students in “Politics and Sports” was the benefit of hearing vastly different perspectives—from across the world—all in one class. This opportunity is something an online platform can uniquely provide. “Engagement with the greater network of Georgetown and its multiple campuses is a valuable tool and possesses a lot of potential for engaging learning experiences,” Iyer says.